What It’s About: Bambi meets Godzilla in the forest. The results are not pretty. Why Watch it Today? : Gojira was released on this date in 1954, eventually becoming iconic as Disney’s gentler creation Bambi. In 1969 Marv Newland made this classic cartoon student short, which was a staple of cable during its early, Wild-West, desperate for content (before they realized they could just film people being jerks to one another). 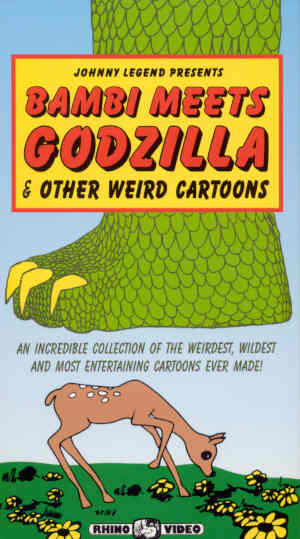 It was also released as the cartoon short accompaniment to Godzilla 1985 when it premiered in U.S. theaters. This entry was posted in Animation, Black and White, Comedy, Independent, Kaiju, Movie of the Day, Short and tagged Bambi, Godzilla, student film. It used to be a lot easier to make a “shocking” or “bad taste” cartoon.